These Farm Heroes level 155 cheats and tips will help you beat level 155 of Farm Heroes. 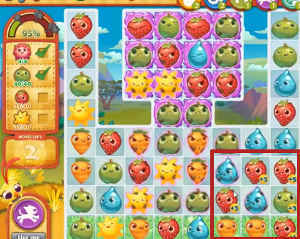 The objective of Farm Heroes level 155 is to obtain 40 strawberries, suns, and apples, as well as 4 flowers, in the span of 24 turns. Though flowers are notoriously difficult to collect, you should wait until you have no choice to begin opening them. This is because they’re the only thing blocking the grumpy cropsies above from entering the main part of the board; since you have lots of cropsies to collect in very little time, don’t make your job harder by adding cropsies that won’t add to your score. Adding grumpy cropsies to the board will probably lose you the game. Not to be negative, but game over. Grumpy cropsies will ify the points from your matches, and ruin everything you once loved. Sorry, but that’s the truth. 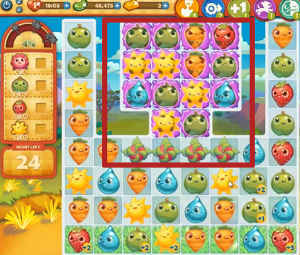 The bottom of level 155 is covered in green grass, making it an ideal place to make efficient matches. Not only will you rack up extra points naturally from the grass’s effects (they add a +1 point bonus to any match formed on their area), you’ll also be very likely to begin a cascade. This will help you remove additional cropsies without spending an extra move. Cropsy cascades work by chance when reinforcing cropsies fall onto the board. Through happenstance, the new cropsies might fall into the right spot, near pre-existing cropsies, to form matches all on their own. This is one of the most useful strategies in the Farm Heroes Saga universe. With over 120 cropsies to harvest, you’ll need to make matches of 4 and 5 as much as possible to advance. When your cropsies gain bonuses, trigger them together and/or in grass squares to make the most of your extra points. This will help conserve your turns for use in Hero Mode and get you past Farm Heroes Saga level 155. 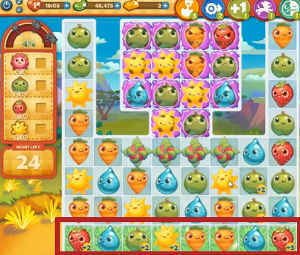 Chain cropsy combinations are the Achilles to your mighty army of cropsy match warriors. They are the backbone of your forces. Forming 6 chain cropsies in a T or L shape is particularly advantageous for this purpose. These combos will disperse +1 bonuses across the map which converge with the extra points from forming matches on the grass to form a glorious Voltron of cropsy collection!